In times of tragedy, common expenses can become a major inconvenience and source of stress. United Way’s Emergency Labor Assistance Program (ELAP) is a partnership between local organized labor and United Way of the Greater Capital Region, designed to help meet temporary financial needs of union members when emergencies occur. This year, United Way and ELAP assisted Jim’s family when his daughter gave birth to premature twins who suffered serious complications before one boy passed away. The surviving twin, Kaleb, remained hospitalized for another four months. Jim, a machine repairman at the GE Global Research Center, was concerned because the boys’ father was forced to take time off without pay. United Way and ELAP responded by helping the family cover basic expenses. As contributors to United Way for 10 years, Jim and his wife never expected to be on the receiving end of help. “I appreciate everything everyone has done to help my daughter get through this,” Jim said. “We still have a long road ahead of us but Kaleb gets stronger every day.” Download the ELAP flyer to learn more about the program. NYSNA (New York State Nurses Association), CWA (Communication Workers of America) 1141, the Saratoga Central Labor Council, Troy Teachers Association, and UA Plumbers and Steamfitters Local 7 collected clothing, non-perishable food and toiletries for the YWCA - Northeastern New York. All local unions participated in the NALC (National Association of Letter Carriers) annual food drive, resulting in more than 70 million pounds of food collected and distributed across the country. 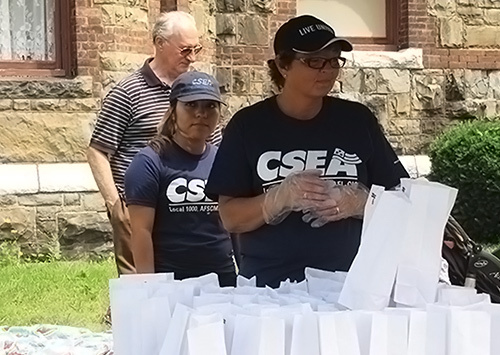 CSEA staff, NYSUT, PEF, CSEA Unit #8458 (Shenendehowa School District) served as volunteers to distribute summer meals to children through United Way's United Against Hunger initiative. IUE-CWA 81359 made financial contributions to help feed local children-in-need. NYS ALF-CIO sponsored Community Service t-shirts to promote volunteering by its members. CSEA staff volunteered to hand out nutritious summer meals to children who rely on free and reduced price lunches during the school year.